The private residential property index fell 2.3 points from 211.6 points in first quarter 2014 to 209.3 points in second quarter 2014, according to the Urban Redevelopment Authority (URA)’s flash estimate of the price index for private residential property released today. This is a decline of 1.1 percent, compared to the 1.3 percent decline in the previous quarter. Additionally, this is the third continuous quarter of price decrease. 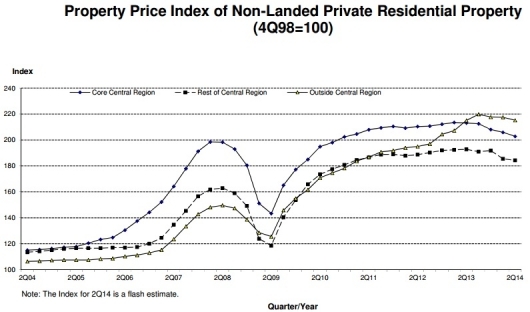 Prices of non-landed private residential properties in all market segments declined in Q2 2014. In Core Central Region (CCR), prices fell 1.5 percent, higher than the 1.1 percent decline in Q1 2014. Prices in Outside Central Region (OCR) decreased by 1.1 percent, higher than the 0.1 percent decrease in the previous quarter. In Rest of Central Region (RCR), prices fell 0.6 percent, compared to the 3.3 percent decline in the previous quarter. Prices of landed properties fell 1.5 percent, higher than the 0.7 percent decline in the previous quarter. This entry was posted in Property Market / Real Estate and tagged Private homes prices, Private Residential Property, URA, Urban Redevelopment Authority. Bookmark the permalink.